Meet Charlie! Charlie has spent his days in the office with us since he was three months old, and he’s a very loyal little member of our team. He likes nothing better than greeting clients in reception when he gets the chance! If little Charlie was ever orphaned, our staff would be queuing up to take him, but have you thought who might care for your much-loved pets in the event of your death? It is estimated that thousands of pet owners in the UK die each year without making arrangements for their pets in their wills. Many of those pets are sadly euthanized. If you want your pet taken care of, you have to make a plan. Many high profile celebrities have addressed the problem in flamboyant style – Majel Barrett-Roddenberry, the widow of Star Trek creator Gene, set up a $4 million trust for their dogs, plus an additional $1 million for a domestic employee to care for them, and the late Gail Posner’s bestowed $3 million in trust funds and her $8 million mansion to her three dogs, who presently ride to the pet spa each week in a gold Escalade! For those of us without their megabucks, here’s what you can do. While we may consider our pets as family, our legal system considers them property and so you cannot leave money or property directly to your pet in your will, but you can choose someone who will care for them as you do. Do discuss it with them first, as not everyone is willing or able to look after a pet. Your Will should then include a clause passing care of your pets to your chosen person, along perhaps with a sum of money and a request they use it for the pet’s care. If you really don’t know anyone suitable, some charities may be able to help. The RSPCA provides a free service called “Home for Life”. Where a pet has been signed up for the service the RSPCA promises to find a suitable and loving new home as soon as they can in the event of the pet owner’s death. In the meantime, the pet will be cared for at an RSPCA animal centre. The RSPCA has published some suggested wording for including in a will to ensure that care of your pets is passed to the RSPCA in the event of your death. They ask to be notified of your wishes before you die and for you to send them a copy of your will. Why not pop in to our office and meet Charlie, and discuss the plans you can make at a free half-hour interview? © 2019 WMB Law Ltd. Registered in England & Wales. No. 05490109. VAT No. 741601757. 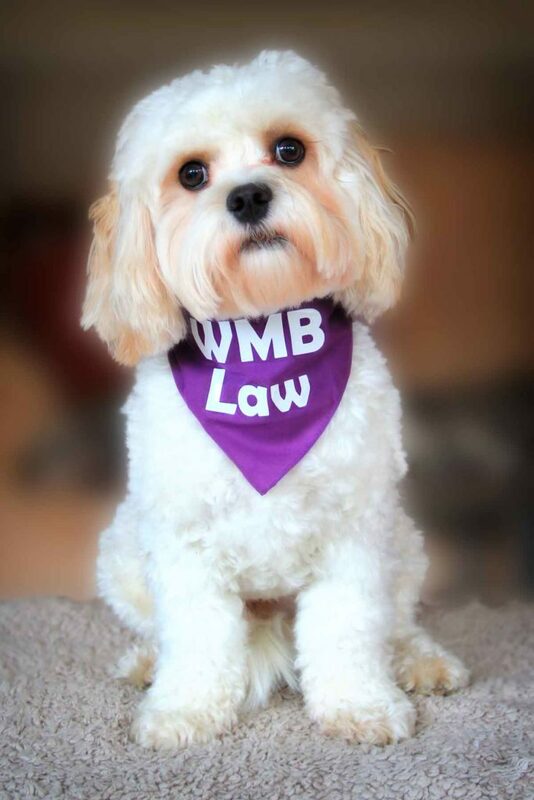 WMB Law Ltd are authorised and regulated by the Solicitors Regulation Authority. SRA No. 424034.